Editor’s Note: This monthly blog from Scott Wise, JMP Principal Engineer, seeks to find interesting uses of statistical discovery to solve deep questions dealing with business/economics, sports, history and psychology. 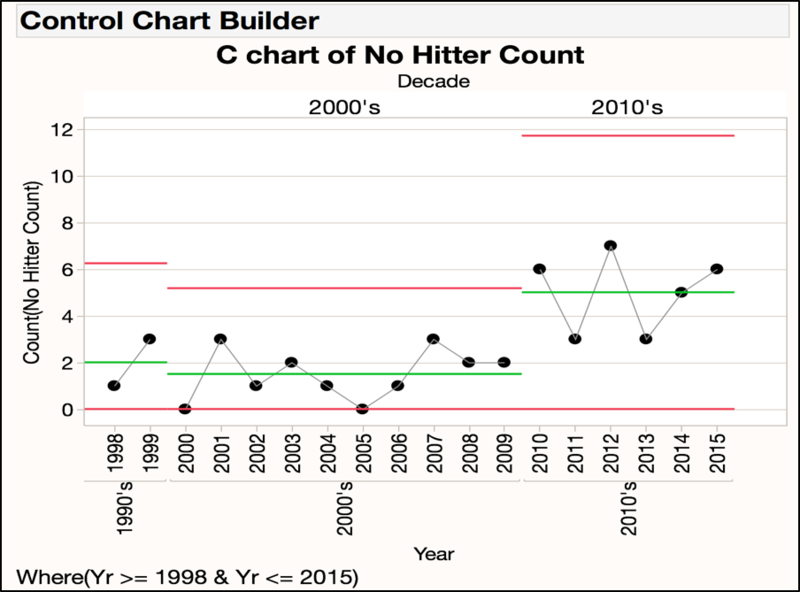 This month’s entry looks at solving the debate on whether baseball no-hitters by year are increasing in number. Thanks to JMP Baseball Expert Lou Valente for his help with this subject! On a recent trip late this summer, I was able to take in a Seattle Mariners baseball game on a lovely night in the Pacific Northwest. Unfortunately, the Mariners went down in defeat at the hands of the Orioles that night. However, the very next day, Mariner’s pitcher Hisashi Iwakuma went on to throw the fourth no-hitter of this year! For any non-baseball aficionados, a “no-hitter” (or “no-no”) is a rare baseball game where the pitcher does not allow any hits to the other team over the course of the entire game. There have already been six no-hitters thrown this season, putting us within one of the all time record of seven in a season (last seen in 1990, 1991 and 2012). While historically we average only two no-hitters per season, we are seeing totals well above the average since 2010! So a hot debate has started up in trying to explain this rash of no-hitters in modern day baseball. First we looked just the pattern of no-hitter counts by year on a scatter plot graph shaded by density. As the NY Times article pointed out, there have been other years where a high number of five or more no-hitters were thrown, mainly in the 1960’s and the early 1990’s. But visually we can see that the 2010 decade is worth more investigation as no fewer than three no-hitters have been thrown so far for six straight years! We next graphed total no-hitters count by decade. It is plain to see that even with four more years to go to finish the 2010 decade, the first six years have yielded a whopping 30 total no-hitters so far. If we even only see closer to a historic average over the next four years of two to three no-hitters thrown, we would still be on track to see the highest total no-hitter decade ever (of 38 to 42 total no-hitters)! So this seems to yield some credence to the Yahoo Sports claim of increasing no-hitters in modern baseball today! However, baseball has changed significantly over the past one hundred years with changes often made to increase the excitement of seeing more offense (hits, homers and runs) that would make it harder to throw no-hitters. For example, right at the end of the 1960’s the pitchers mound was actually lowered in an effort to increase offense and reduce the strong advantage that pitching seemed to hold in this decade. But sometimes changes can help to increase the chance of seeing no-hitters, such as the league expansion in the 1990’s that added four new teams and therefore more games and chances for no-hitters in the regular season! So the fair comparison might be to focus in on the more recent time frame when the rules and number of teams/games were roughly the same. 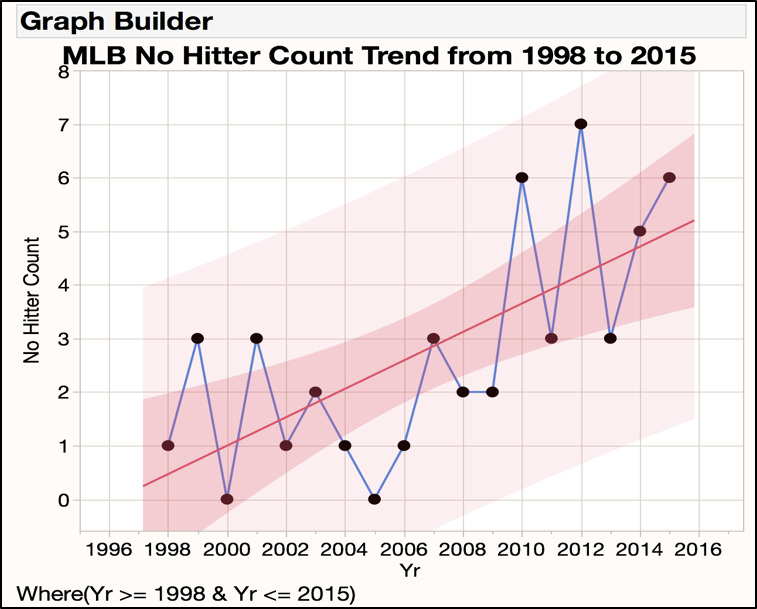 So starting in 1998 we looked at the overall no-hitter count trend through the season so far in 2015. By fitting a trend chart over time, you can easily see that there does seem to be an overall trend showing an increasing number of no-hitters in baseball. You can also see a fitted line drawn through the chart with fit and prediction confidence interval shadings that gives us a little more visual evidence of the upward trend in no-hitters. 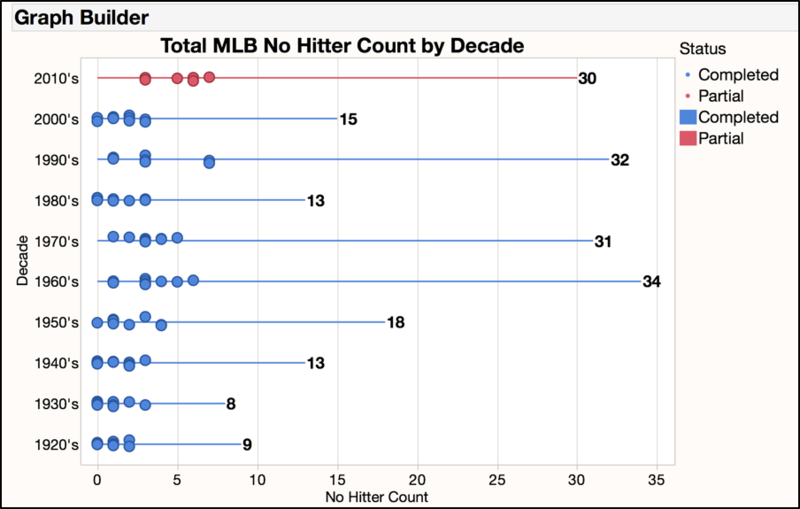 While there is still a lot of variation in no-hitters from year to year, the trend still looks to be holding firm. To take this a step further, we applied Control Charts by decade (in this case an attribute C chart for counts) to get another perspective. Control Charts have been described as “run/trend charts on steroids” and basically adds control limits to our chart which represent the expected variation we expect to see around any given year. You can see the difference in the average no-hitters in the 2010’s at 5.0 being much higher than what we have seen so far in the 2000’s at 1.5 no-hitters. For the 2010’s decade we can see much higher expected top end of no-hitters, as seen in the UCL (upper control limit), of up to 11.7 no hitters. Which means we may have hope of experiencing a truly record breaking no-hitter count of above seven games before the 2010 decade is over! So lastly after showing that a trend does seem to exist in the rise of no-hitters, we naturally want to know what is causing this surge? Mike Oz at Yahoo Sports offered up a few good theories on the rise of no-hitters in the 2010s. The most popular cause often sited is that offensive numbers (hits, homers and runs) are down across the league. But this is a tougher case to prove as while some teams have seen their offensive output take a nose dive (from Atlanta to New York), several teams have seen their offensive output improve greatly over the years (from Houston to Toronto)! The other probable cause Mike offered (that brings a smile to my face) is the fact that perhaps pitchers and defenses are much better prepared to face opposing team batters due to the huge growth of baseball player and game situation statistics and analysis. Therefore, knowing the best way to pitch to a batter and even changing the positioning of defensive players for specific batters can give the pitcher ands team the edge in preventing hits! 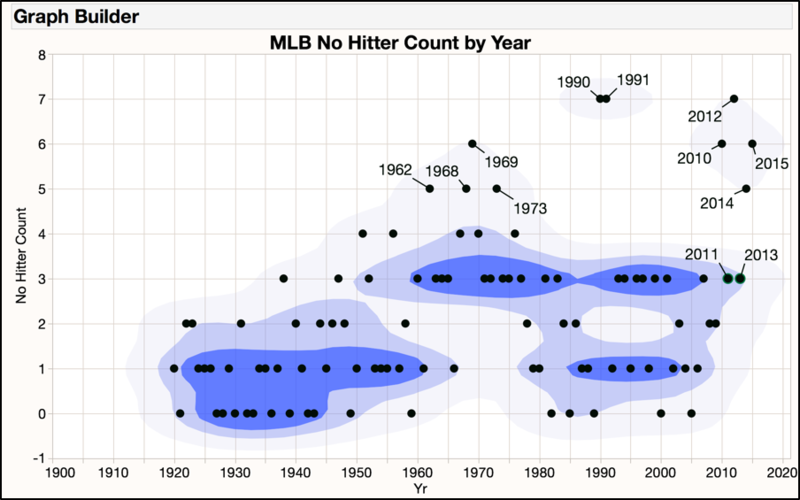 While theories on the causes of the increase in no-hitters will be hard to prove out, it is clear that we are in a period of increasing and potentially record breaking no-hitters occurring each season! So keep an eye out as we move toward the finish of this baseball season and start of the next one. More no-hitters are coming and you might just get to see a one thrown by your favorite team! 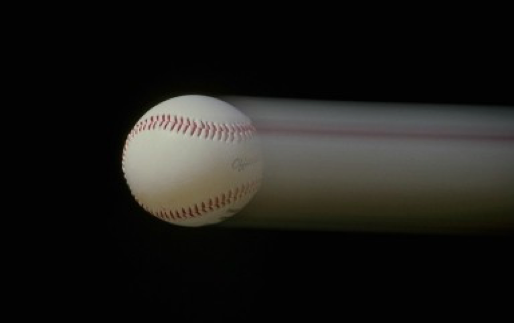 One other potential causal factor is increasing performance enhancement drug vigilance...balls that might have gone out for HRs are fly ball outs in places like the power alleys of Yankee stadium and other ball parks, which have the reputation of being a place where 'home runs go to die'. Great comment Peter and definite a good point that could have had an effect on the number no-hitters! The use of unchecked PEDs (performance enhancing drugs) throughout the 90's and the ensuing testing crackdown starting in 2003 was a another popular theory on the reasons for declining offense put forward by a lot of Sports Writers. However like all the other theories, it doesn't always align cleanly as we did have two record years of seven total no-hitter seasons in 1900 & 1991, right during the height of the PED era. However my father always talked about the virtue of good team offenses that would consistently win (and usually make the post season) by playing "small ball"...trying to get higher percentage base hits while at bat instead of just trying to knock it our of the park each time for harder to hit home runs for their main offense (of which his beloved Atlanta Braves were often guilty of doing)! So maybe that PED using power hitters swimming for the fences and hitting more long fly balls for outs in the outfield actually helped some of the pitchers chase a no-hitter! In any case for those of us who enjoy a good pitching duel and the thrill of a no-hitter...life is good! I think your Control Chart blows the trend plot out of the water. There seems to be a special caue that happened sometime at or near the 2009 - 2010 time frame. Thus there was not a trend, but a shift that occurred.